One of the things I got back when I returned to the house was my garden. When I lived in the post-divorce apartment, I was above it all. I had a front porch, but no real contact with the soil. It was fine. 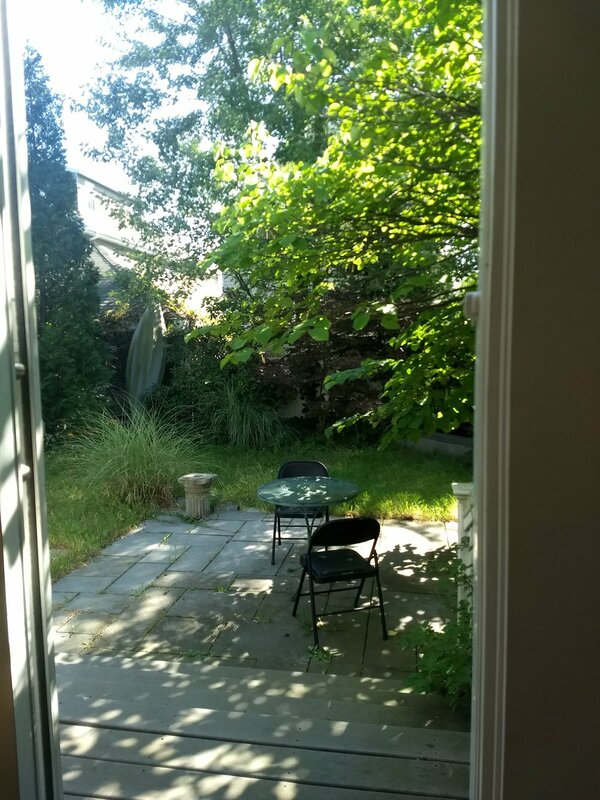 My current office (a corner of the dining room) overlooks the back yard. The bushes and trees were much overgrown when I returned and many of the perennials gone. I won't prune much until next year, since winter is on its way, though I am taking some of the bamboo back. I do get to feed the fish in the small pool every day. Nothing exotic, just thirty-nine cent goldfish that have grown surprisingly large. I can't really tell them from koi anyway, because I'm a total heathen. But I go out every day and walk around and check things out, think about what I want to do next spring. Most of the butterfly garden is gone. Some years ago I had a neighbor whose back yard abutted on the yard of our triple decker. I was just starting to garden then, and Sinclair's garden was quite impressive. And every day she would get home from her job at MIT, and would walk around it with a drink and a cigarette, considering its many details. She really looked at it. So I try to channel her, and really feel what the garden is, and what might be changed. Sinclair would readily move plants, just to see if things could be improved. She gave me much advice across the back fence, and she was one of my favorite neighbors of all time. My next door neighbor Lisa is a gardener too, as well as another writer, so I do have another compatriot. There is not much to be done to it now, so I am not tempted away from my desk. But I do enjoy going out to look at it, while thinking about something. I almost called this post "the perils of having a garden". But that's really wrong. Writing feels more like growing things than building things, and the problems of rearranging things, only to find that a plot point or character does not like its new surroundings, has similarities to managing a garden as well. But writers are prone to elaborate metaphors, so I'll stop there. Still, taking care of something that will only gradually become something, is the perfect pace to relax the mind from the frustrations of making stuff up. For now, I'll chalk that up as a time benefit. Next spring, I may have a different report for you.